Mr Alistair Laidlaw is consultant vitreo retinal surgeon at St Thomas’ Hospital. 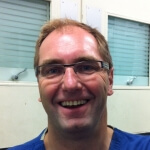 Alistair specialises in diseases of the retina, macula and vitreous. These include eye complications of diabetes (diabetic retinopathy, proliferative diabetic retinopathy and maculopathy), macular holes, retinal detachments, epiretinal membranes and floaters. Cataract surgery is an inherent part of the treatment of many of these conditions. Alistair has introduced electronic medical records and improved processes during his time at the eye department. He was honorary secretary and then president of the UK and Ireland Vitreo Retinal Society (2010-2016). He is an honorary consultant at St Luke’s Hospital for the Clergy, London. Outside work, Alistair enjoys participating in most sports, but particularly cycling, swimming, skiing and sailing. Surgery for diabetic macular oedema, macular structure following retinal detachment surgery and clinical vision measurement.